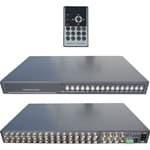 NOTE: TheVM-99516 has been discontinued and replaced with the new and improved VM-16RT 16ch CCTV multiplexer. The new model provides better overall quality and features. Please click on the above image to view the new and improved model. The VM-99516 security camera multiplexer supports up to 16 cameras. The full duplex operation supports recording and playback simultaneously. The smart automatic switcher allows random sequences and dwell time programming. The on screen display setup makes it very easy to configure. Supports priority recording function when triggered by external alarm input. NOTE: TheVM-99516 has been discontinued and replaced with the new and improved VM-16RT 16ch CCTV multiplexer. The new model provides better overall quality and features and is available for $499.99.